A workshop is an activity were students can submit their work to be peer reviewed by the class. The student will get two grades from this activity; a grade from doing the activity and one from the assessment of their peers. For instructions on how to add a Workshop, see Moodle 3: Activities & Resources: Add a Workshop. In the General settings, the instructor must designate a title and provide an optional description or prompt for the assignment. Grade for submission: This sets the maximum grade a student can obtain for submitted work. Submission grade to pass: This setting determines the minimum grade required to pass. The value is used in activity and course completion, and in the gradebook, where pass grades are highlighted in green and fail grades in red. Assessment grade to pass: This setting determines the minimum grade required to pass. The value is used in activity and course completion, and in the gradebook, where pass grades are highlighted in green and fail grades in red. Decimal places in grades: This specifies how many decimals places the grades will display. The default is 2. In this section, instructors specify requirements for submissions. They can provide instructions on submission, change the maximum number of attachements, specify the type of file formats accepted, change the maximum attachment size, and allow late submissions. If enabled, a student may submit their work after the submissions deadline or during the assessment phase. Late submissions cannot be edited though. Instructors can provide instructions for the assessment part of the assignment enable self-assessment. By default, this option is turn off. In the Feedback settings, instructors can disable, require, or allow optional feedback comments in a text box. 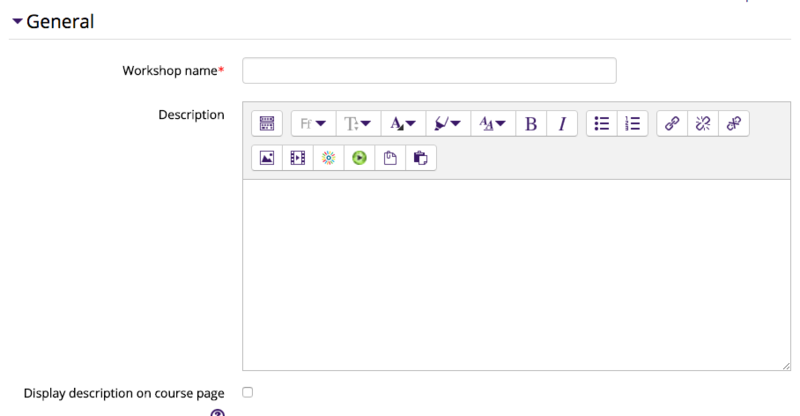 If enabled, a text field is displayed at the bottom of the assessment form. Reviewers can put the overall assessment of the submission there, or provide additional explanation of their assessment. 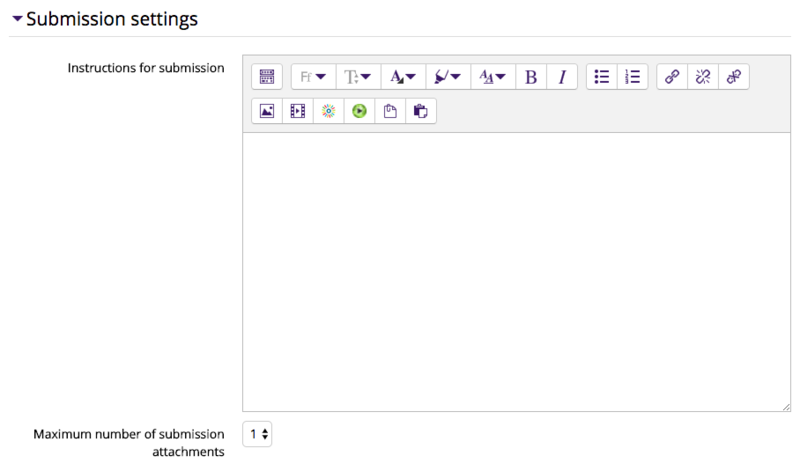 Alternatively, instructors can allow feedback attachments and specify the formats, size, and number of files accepted per submission. The conclusion text is displayed to participants at the end of the activity. 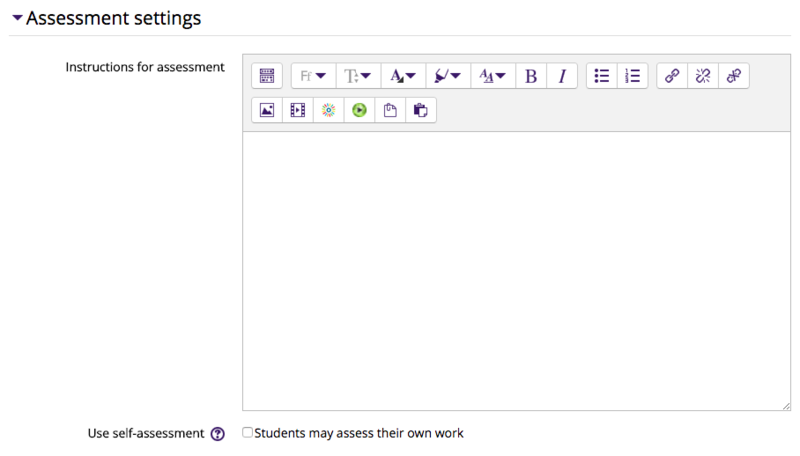 Instructors can opt to provide an example submission to give students practice before assessing a peer's work. If enabled, assessment of the example submission can set to voluntary or set to mandatory either before or after the student's initial submission of their own work. The submission and assessment portions of the workshop can have different and specific deadlines. If enabled, the workshop will automatically shift to the next phase after the submissions deadline. NOTE: If the workshop is set to automatically move into the assessment phase, it is recommended to set up the scheduled allocation method, too. If the submissions are not allocated, no assessment can be done even if the workshop itself is in the assessment phase. These settings specify the visibility of the workshop for students (Hide/Show), and the group mode and grouping can be designated. The workshop can be restricted based upon a date, group, activity completion of another activity/resource in the course, etc. NOTE: If more than one restriction is added, students must meet EACH of the requirements before the workshop activity becomes available. By default, students can manually mark the workshop as complete, but an instructor can change this to be required. If required, the students can be marked complete by viewing the workshop, or receiving a grade.